Number of Lesbian Public Memorials in SF is How Low? A person can hardly walk a few blocks in San Francisco without tripping over a public memorial for a gay man, especially honoring Harvey Milk, but the same surely cannot be said about plaques and such for our lesbian sisters. The total number lesbian public memorials in the City comes to a measly four. There's Alice B. Toklas Place, a three-block long side street between O'Farrell and Geary Streets and bordered by Franklin and Larkin Streets, honoring the San Francisco native. In September 1998, the Board of Supervisors renamed Myrtle Street for Toklas and her extraordinary life as an out lesbian and companion to Gertrude Stein. On the grounds of the Eureka Valley Recreation Center in Castro district is the Rikki Streicher Field and sign designating it so. She was a longtime bar owner, political activist and big supporter of lesbian sports. There's also a plaque near the field that provides more details about Streicher's life and legacy. 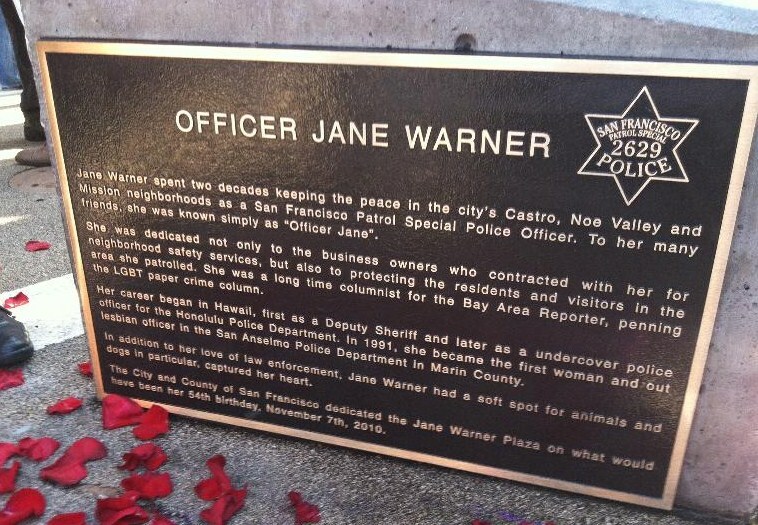 Also is the Castro area is Jane Warner Plaza located at the intersection of 17th, Market and Castro Streets. 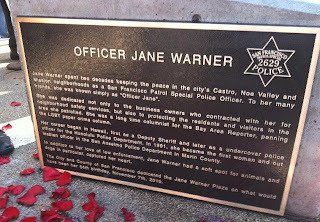 Warner was an out lesbian police officer who died of cancer. A plaque at foot-level that is difficult to read was installed at the plaza in 2010, to educate locals and visitor as to why the semi-public plaza was named for her. The last public sign honoring a lesbian, this time one is who very much alive, is the plaque for politician Carole Migden in the bowl of Harvey Milk Plaza above a metal bench and almost impossible to notice. That's all, folks, for public memorials or plaques in San Francisco for individual lesbians. I'm excluding the plaque at Pink Triangle Park and the one at the base of the semi-public MUMC-controlled rainbow flag located in the City's gayborhood, even though the former says the word lesbian and the latter includes names of lesbian politicians at the time the flag pole was erected, because they're too vague and no one thinks of them as lesbian-specific. Since the Lyon Martin Health Services agency is a private non-profit, named to honor the late Del Martin and still-living Phyllis Lyon, it does not qualify as a public space memorial. Compare these four examples with the almost-innumerable public spaces and things named for Harvey Milk, the plaques for Leonard Matlovich and Mark Bingham, the Tom Waddell Health Center, the quarter-block stretch of 16th Street in front of the Harvey Milk Public Library honoring Jose Sarria, the James C. Hormel Center at the main library, and many a few other public places memorializing specific gay men. Let's not forget the plaques and places gay male related such as the Pink Triangle Park, the Names Project AIDS Quilt plaque at its former location on Market Street, and the Bulldog Baths. There is also the historical marker embedded in the sidewalk in front of what once was the Compton Cafeteria in the Tenderloin, site of the transgender and gay riot in August 1966. Anyone know of a marker or plaque in the City commemorating a out bisexual? Lemme know if you do. Same goes for other examples of lesbian specific public memorials. The paucity of lesbian memorials is not yet of concern to the Board of Supervisors. Recently, Supervisor David Campos generated much attention for himself and a whole lotta divisiveness over wanting to name yet another public facility for Harvey Milk, this time the airport. Supervisor Jane Kim in March made noise about renaming Lech Walsea Street for Tom Waddell because of the Polish bigot's latest homo-hating outburst and the fact that the Waddell health center abuts that street. Isn't about time our lesbian sisters received the public memorializing in San Francisco somewhat close to that done for gay men?